The dining room here is so small, I mistook East Delight for a takeout joint early last year, and so left it off my list of restaurants to review. Recently, I ran across a menu that said "Dine In," so I took another look. Oops. So what does Hunan Delight have to offer? In many ways, pretty much the same thing as its competitor East Delight, a third of a mile away. At East Delight, I marveled at the cheap lunch options, ranging from $5.05 to $6.05. 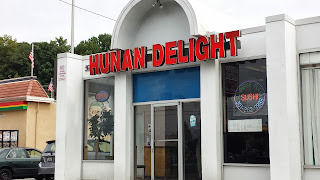 Hunan Delight does them one better, coming in from $4.55 to $5.25. And the food I tried (particularly the kung pao chicken) was probably slightly tastier. Both times I visited, I called in my order ahead of time. The first time, despite it being before 11:30, I had about an eight-minute wait when it came time to pick up my food. I soon found out why -- the woman ahead of me had ordered $122 worth of food. That's impressive, when my meal was under $5 (with tax). The second time (closer to noon), I had the place to myself and my food was ready to go. Having had a look at their kitchen, I decided to forgo their sushi options. There didn't seem to be any dedicated sushi preparation area, or sushi chef for that matter. I was tempted to bump it up to 3 stars, because it is slightly better than East Delight. But I think the same principle applies here as it did at East Delight: "It's not the sort of place anyone would miss if it were gone -- you'd just head down the road a little bit." So now I have seven reviews left to go.